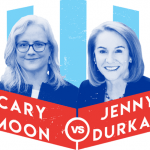 On Wednesday night, Low Power FM station, KVRU, Ranier Valley Radio, hosted a Seattle Mayoral candidate forum with finalists Cary Moon and Jenny Durkan. The candidates responded to questions from three former Mayoral candidates and several South Seattle journalists. KBCS pulled highlights from of the KVRU hosted, Seattle Mayoral Candidates Forum. The full forum is also available.